my first pattern from the colette sewing book! i’ve been itching to try this one, especially after sarai posted a tutorial on how to draft a waistband (which, in case you were wondering – easy easy!). also, SCALLOPS. i think i just jumped on the scallop bandwagon with this. they are a pain to mark, sew & press, but oooh they are so happy! i used a piece of wool houndstooth that i got from lauren winter, during that awesome yardsale where i bought half of her fabric stash. this piece of fabric cost me a whopping 75 cents. everything else was already in the stash – the lining (a remnant left over from a dress i made 4 years ago – yeesh, do i throw anything away? well, it’s gone now. gone inside my skirt, i mean. ), the bias tape, even the zipper & thread. 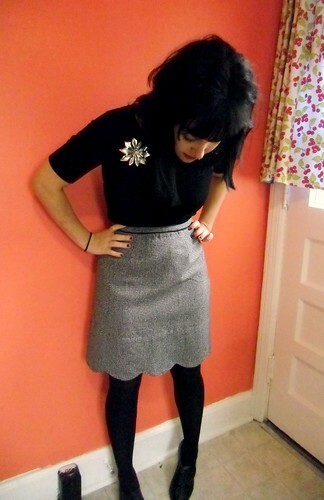 75 cent skirt, yo! cutting this pattern out was… interesting. it calls for a lot of yardage, but i only had 3/4 yard of the houndstooth. it was 60″ wide, though, so with some careful folding, i was able to get my skirt cut out with practically nothing to spare. cutting off the top to make a seperate wasistband really helped, as it shortened the length of the skirt so that the skirt & the facing fit exactly at the 3/4 yard length. i suppose one could use a different fabric for the facings (on both the scallops & the waistband) if you were really running short. i had exactly enough, though! 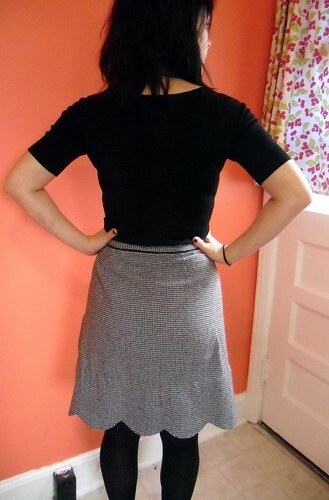 if you want my honest opinion on this skirt, it alone is worth the $18 that the book currently costs on amazon. go get it! i really only added piping because i wanted to test out my new piping foot 🙂 verdict: omg how did i live without a piping foot??? the lining makes me so happy! So cute! I love the piping. I’m glad to hear it’s possible to squeeze this out of less fabric. I have a bunch of 1 yard pieces that I’d love to use for the Meringue. As for Thanksgiving, I’d go with whichever one leaves the most room for post turkey tummy expansion. 🙂 All of your outfits are equally gorgeous. That’s a really pretty skirt… I was thinking of making one this weekend… I got such a laugh out of your last post about the Clover pants! I didn’t know what a FUPA was and I had to google it! Too funny! Nobody would ever suspect you had one with your cute figure!! Happy Thanksgiving! The skirt looks amazing! That book is in my amazon cart right now; very excited about it! Another beautiful make!!! I can’t wait to get my hands on that book! 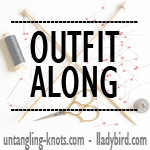 I think you should do a few costume changes for Thanksgiving – it’s a celebration after all! And yay to you learning to knit! 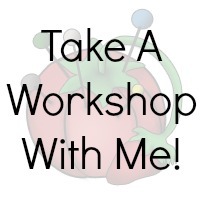 I’m 7 weeks into an 8 week course and I’m totally hooked…love it! Cute skirt! 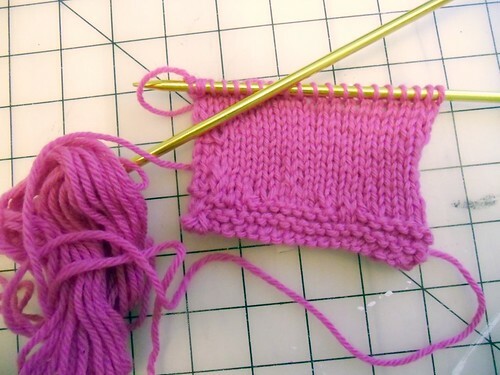 Your knitting looks great for just starting! 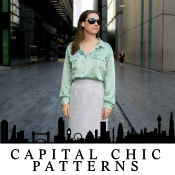 I adore this… great fabric, great style and great additions to the basic pattern (i.e. 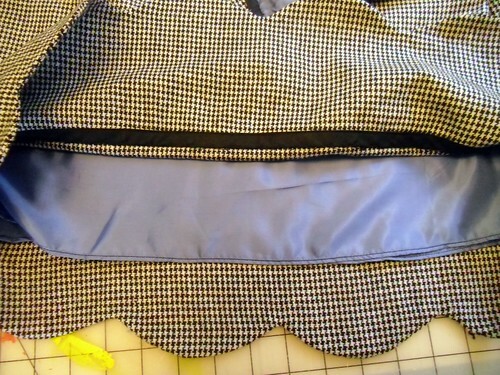 waistband and piping) I can’t wait to get the book, but it’s on my Christmas wish list, so I have to be patient. Good luck with the knits and the purls! 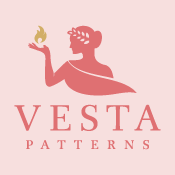 I’ve been pretty skeptical as to if I actually like the patterns in this book or not, but I think it might just be all the sugar sweet styling and pastel fabrics they used. Your houndstooth version is so cute and I love the added waistband! Amazing! love your fabric choice and inclusion of piping. beautiful fit too. now you’ve enticed me further to get the book……. 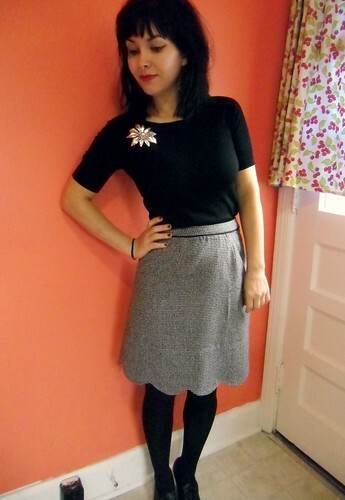 I really adore this in houndstooth! FABULOUS! Ok, I need to get the book , pronto!! I nearly gasped in awe when I saw your meringue. It is surely the picture of heaven in a skirt. Everything about it. Love. I’ve got to wait till Xmas to see if any of my sons are man enough to buy this awesome sewing book for their mum. They usually avoid anything uncomfortable preferring DVDs and music instead. Beautiful skirt! I have a foot that would work for piping, but I’ve never used it for quite that purpose. Your cute waistband is enough proof that I need to remedy that. Love the scallops, too. Definitely a skirt that deserves a lot of wear! Gorgeous! 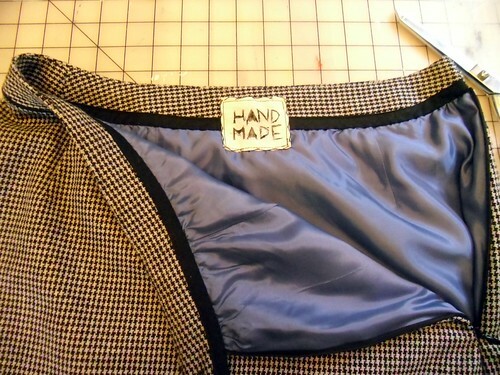 Love the piping additions – really sets off that houndstooth. I lurves me my piping foot. I could pipe my house given half the chance.Uber-excited now – Amazon has just despatched Colette Sewing Handbook to me today. I’ve waited patiently since July – the time is now! Really fabulous skirt Lauren! Well done. Piping is the perfect finishing touch isnt it? 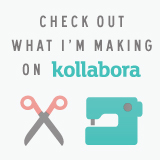 I love using it though I don’t have a piping foot – yet! Also, yay for your knitting! Ooh that’s lovely. I can’t wait for amazon to dispatch my Colette book! Happy thanksgiving. Why oh why do you keep tempting me with Colette tantalisers?! First telling me you’re curled up on the sofa reading the book, then some ace sewing tips from it, and now THIS!!!!! I love it, it’s gorgeous Lauren and like some other commenters have said, you’ve made it look even better than the version in the book. Well, what I’ve seen of the book, I believe mine’s arriving next week. CAN’T WAIT!!! My book arrived the other day & I can’t wait to get started on the patterns in it!!! Oh, too cute! I love this, it’s amazing. My mamala is getting me the book for Hanukkah, so I will just have to wait until then to emulate you. Sigh. But the piping, she is so happening. And way to join the knitting bandwagon! Fair warning, it’s crazy addictive. You can do it anywhere. ANYWHERE. It’s like warm wooly crack. And frankly, probably about as expensive…. PS Did you dye your hair? It looks awesome. i did! it was supposed to be dark brown but it’s practically black. haha oops! Awww…! This is lovely! Love the fact that you’ve used quite a smart fabric for a quirky skirt – means it’s not too saccharine cute if you know what I mean. Love it! Scallops are so hard! But look sooo good.